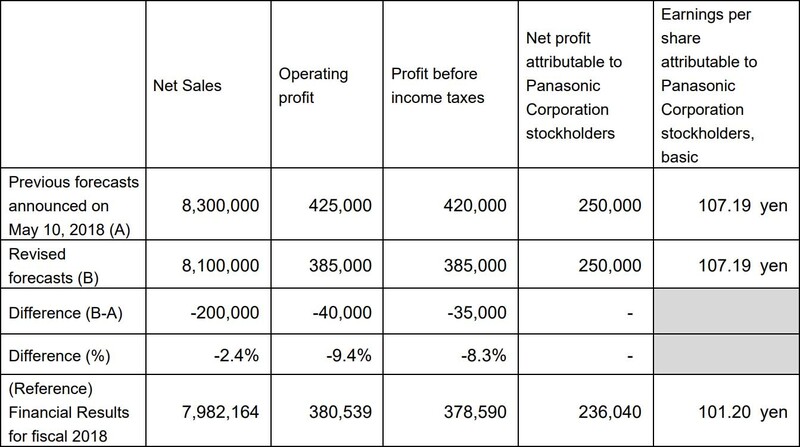 Osaka, Japan, February 4, 2019 — Panasonic Corporation ([TSE:6752] “Panasonic”) today announced to have revised its financial forecasts for the current fiscal year ending March 31, 2019 (fiscal 2019) from the forecasts announced on May 10, 2018 based on the recent business conditions. For the consolidated financial forecast for fiscal 2019, the sales forecast, announced on May 10, 2018, is revised downward due mainly to weakening sales in Appliances and Automotive & Industrial Systems. In addition, the forecasts for operating profit and profit before income taxes are also revised downward as the effects such as partial revision of pension system are unable to off-set the impact of sales decrease. On the other hand, net profit attributable to Panasonic Corporation stockholders remains unchanged due to the improvements of income taxes and others. This press release includes forward-looking statements (that include those within the meaning of Section 27A of the U.S. Securities Act of 1933, as amended, and Section 21E of the U.S. Securities Exchange Act of 1934, as amended) about Panasonic and its Group companies (the Panasonic Group). To the extent that statements in this press release do not relate to historical or current facts, they constitute forward-looking statements. These forward-looking statements are based on the current assumptions and beliefs of the Panasonic Group in light of the information currently available to it, and involve known and unknown risks, uncertainties and other factors. Such risks, uncertainties and other factors may cause the Panasonic Group’s actual results, performance, achievements or financial position to be materially different from any future results, performance, achievements or financial position expressed or implied by these forward-looking statements. Panasonic undertakes no obligation to publicly update any forward-looking statements after the date of this press release. Investors are advised to consult any further disclosures by Panasonic in its subsequent filings under the Financial Instrument and Exchange Act of Japan (the FIEA) and other publicly disclosed documents. The risks, uncertainties and other factors referred to above include, but are not limited to, economic conditions, particularly consumer spending and corporate capital expenditures in the Americas, Europe, Japan, China and other Asian countries; volatility in demand for electronic equipment and components from business and industrial customers, as well as consumers in many product and geographical markets; the possibility that excessive currency rate fluctuations of the U.S. dollar, the euro, the Chinese yuan and other currencies against the yen may adversely affect costs and prices of Panasonic’s products and services and certain other transactions that are denominated in these foreign currencies; the possibility of the Panasonic Group incurring additional costs of raising funds, because of changes in the fund raising environment; the possibility of the Panasonic Group not being able to respond to rapid technological changes and changing consumer preferences with timely and cost-effective introductions of new products in markets that are highly competitive in terms of both price and technology; the possibility of not achieving expected results or incurring unexpected losses in connection with the alliances or mergers and acquisitions; the possibility of not being able to achieve its business objectives through joint ventures and other collaborative agreements with other companies, including due to the pressure of price reduction exceeding that which can be achieved by its effort and decrease in demand for products from business partners which Panasonic highly depends on in BtoB business areas; the possibility of the Panasonic Group not being able to maintain competitive strength in many product and geographical areas; the possibility of incurring expenses resulting from any defects in products or services of the Panasonic Group; the possibility that the Panasonic Group may face intellectual property infringement claims by third parties; current and potential, direct and indirect restrictions imposed by other countries over trade, manufacturing, labor and operations; fluctuations in market prices of securities and other financial assets in which the Panasonic Group has holdings or changes in valuation of non-financial assets, including property, plant and equipment, goodwill and deferred tax assets; future changes or revisions to accounting policies or accounting rules; the possibility of incurring expenses resulting from a leakage of customers’ or confidential information from Panasonic Group systems due to unauthorized access or a detection of vulnerability of network-connected products of the Panasonic Group; as well as natural disasters including earthquakes, prevalence of infectious diseases throughout the world, disruption of supply chain and other events that may negatively impact business activities of the Panasonic Group. The factors listed above are not all-inclusive and further information is contained in the most recent English translated version of Panasonic’s securities reports under the FIEA and any other documents which are disclosed on its website.